I read Moneyball by Michael Lewis about 10 years ago. It changed how I viewed baseball (which I love) and how I view business (which I also love, but not quite as much as I love baseball). In Moneyball, Billy Beane (the Oakland A’s General Manager) proves how to win games with less money than anyone else by recognizing undervalued assets and looking at a new set of statistical measures for success. It’s fair to say that Billy Beane’s strategies, that book, and the art of “Sabermetrics” has changed the game of professional baseball more than anything else in the past 50 years. More than steroids, instant replay, the Internet, and luxury suites—combined. What’s interesting, though, is that Billy Beane never won a World Series. It never quite worked out. But a young acolyte of his, Theo Epstein, took the “Beane Way” and combined it with some money (like a 70% Beane + 30% Payroll combination) to win World Series’ for baseball’s two most storied and most historically depressing ball clubs… First the Red Sox and then my beloved Cubbies. The Cubs Way follows the Cubs’ five year journey from worst to best—a journey that started with Epstein joining the club and pronouncing that it’d take five years to make them win the big ‘ship… and he was right on target. “If we can’t find the next technological breakthrough, we maybe we can be better than anyone else with how we treat our players and how we connect with players and the relationships we develop and how we put them in positions to succeed. Maybe our environment will be the best in the game, maybe our vibe will be the best in the game, maybe our players will be the loosest and maybe they’ll have the most fun and maybe they’ll care the most. It’s impossible to quantify” (99). “The Cubs attitude is positive, powerful, action-oriented, and resilient. It is an attitude that says, “I am” and “I do.” It is an attitude that says, “No matter what happens, I will continue to grow, and I will always find a way” (107). “After the 2012 season, as he does each year, Epstein took a Change of Scenery survey. He asked his 40 or so scouts and baseball operations people to submit a list of names of major and minor league players they believed would flourish with a change of scenery and why. Clashes with a manager, problems at home, an injury kept quiet, a positional logjam—anything could be holding back a player that didn’t show up on traditional metrics” (116). “An amazing statistic from the Cubs’ 2016 World Series run: “Chicago would use 11 pitchers in the World Series. Epstein acquired every one of them from other organizations” (282). The book is a five-year journey focusing on character, specific types of talent, problem solving, timing, and hard work. 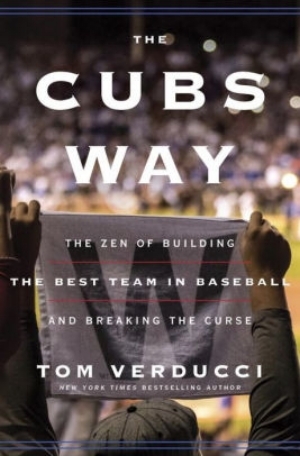 It’s a behind-the-scenes scrapbook of the breaking of a 108 year “curse.” If you don’t care about baseball, you probably won’t care too much about this book—but it’s remarkably light on baseball strategy and heavy on purposeful team-building. Questions I ask Before I Read a Book: Who Endorsed it? I won't share your contact information with anyone else. Ever.